More focus on business expansion with our seamless, cloud-based technology. 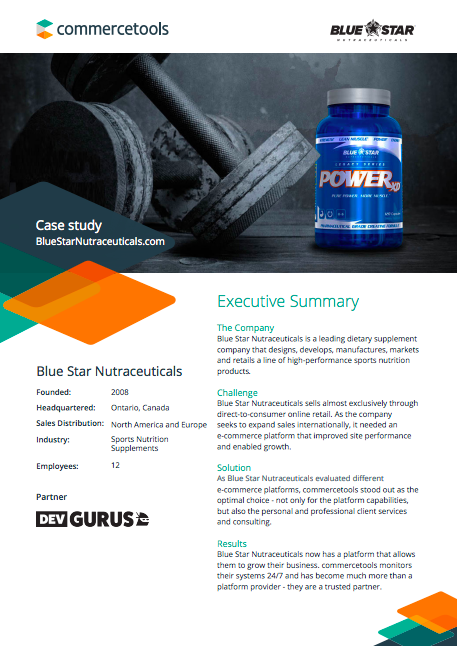 Blue Star Nutraceuticals is a Canada-based leading dietary supplement company that designs, develops, manufactures, markets, and retails a line of high-performance sports nutrition products. As they aimed at expanding sales internationally, they needed an e-commerce platform that improved site performance and enabled growth. commercetools stood out as the optimal choice in the evaluation process - not only for the platform capabilities, but also the personal and professional client services and consulting. To download the case study, please fill out the form.